Learn to create beautiful, functional mugs, bowls, vases, and other pottery using an electric potter's wheel. This class is for beginning to intermediate students who would like to learn the fundamentals of throwing and trimming. We will also explore adding handles and decorating techniques. No experience necessary. This is a three day class during the March session of Ozark Folk School. Registration deadline is two weeks before the beginning of class. 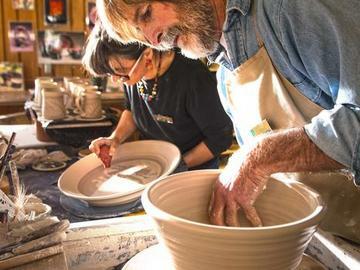 John Perry and Judi Munn are the resident potters at the Ozark Folk Center. During the visitor season, as they make the beautiful pottery they sell in their shop and throughout the southeast, they demonstrate the art of making wheel-thrown pottery to the public. They form pots, mugs, plates, bowls, jars, vases and cups out of raw clay. The following day, they trim and decorate them. To decorate the pot they press a fern or hand-made stencil into the surface of the clay. Colored clay, or slip, is then painted over the stencil. Once the colored clay stiffens, the fern or stencil is removed. Judi Munn’s path to become a potter was not a direct one. She is certified to teach and holds a Master Degree in a field other than pottery. Judi took up pottery with the idea of adding Art to her list of teaching certifications. In 1992, after a year and a half of classes, she got an apprenticeship at the Ozark Folk Center with David and Becki Dahlstedt. Her husband John Perry began his apprenticeship in pottery in 1996. They both teach pottery at various times of the year at the Folk Center. They say “We love making our living using our hands. It is satisfying to start with a lump of clay and produce a piece of work that may last for 5000 years, or more! The work sold here is functional stoneware. We designed it to be used and enjoyed." Judi’s work is in the collections of Hillary Rodham Clinton and Senator Dale Bumper’s wife. An article written by Judi was published in January of 2002 in Ceramics Monthly Magazine. It was called “Pure Whimsy” and focused on her slip decorated animal pottery. One of her pitchers is included in the book 500 Pitchers. This class is for students 16 and up.